I first heard about Laura Marling because of her association with Mumford & Sons. She's also known for being an original member of London band Noah & The Whale. With those two bands in mind, you can guess that Laura Marling is definitely in the folk music business. 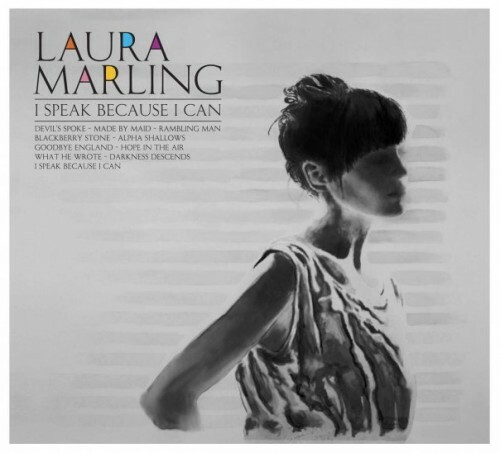 Her second album, I Speak Because I Can, came out a few months ago in March but I overlooked it then so I had to come back and post something about it as it's grown to be a favorite of 2010. Not too many albums that get as mellow as points of this album does can manage to still keep my attention like I Speak does. Songs like 'Made By Maid' and 'Blackberry Stone' are very little more than nice folk songs on the surface, but Laura's voice and lyrics in combination with the wonderful production of Ethan Johns makes it pretty powerful stuff. The best moments on the record come when she's joined by the gentlemen from the aforementioned Mumford & Sons. The highlight track for me has to be 'Alpha Shallows'; very few moments on Sigh No More even reached that level of emotion and intensity, mainly because of Laura Marling's voice. Another great track with the band is 'Hope In The Air' where she is even lent backing vocals by Marcus Mumford. Although I stumbled upon Laura Marling because of Mumford & Sons, she's doesn't have to ride on their coattails at all. Marling has proven with this second album that she might even have the brighter career ahead.